This article is about the March 2017 attack in Westminster. For the similar attack in June 2017 in London, see 2017 London Bridge attack. For the incident in 2018, see 2018 Westminster car incident. For other uses, see Westminster attack. On 22 March 2017, a terrorist attack took place outside the Palace of Westminster in London, seat of the British Parliament. The attacker, 52-year-old Briton Khalid Masood, drove a car into pedestrians on the pavement along the south side of Westminster Bridge and Bridge Street, injuring more than 50 people, four of them fatally. He then crashed the car into the perimeter fence of the Palace grounds and ran into New Palace Yard, where he fatally stabbed an unarmed police officer. He was then shot by an armed police officer and died at the scene. Police treated the attack as "Islamist-related terrorism". Masood reportedly said in a final text message that he was waging jihad in revenge for Western military action in Muslim countries in the Middle East. Amaq News Agency, which is linked to Islamic State, said the attacker answered the group's calls to target citizens of states that are fighting against it, though the claim was questioned by the UK police and government. Police have found no link with a terrorist organisation and believe Masood acted alone. Prior to the attack, the UK Threat Level for terrorism in the country was listed at "severe", meaning an attack was "highly likely". There had not been a killing at the Palace of Westminster since the assassination of Airey Neave by the Irish National Liberation Army in 1979, which took place close to New Palace Yard, during the Northern Ireland conflict. 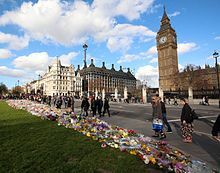 The previous terrorist attack to have caused multiple casualties on the British mainland had been the 7 July 2005 London bombings. Shortly before the attack, a division (vote) had been called in the House of Commons. At 14:40 local time on 22 March 2017, a grey Hyundai Tucson, hired in Birmingham, was driven at up to 76 miles per hour (122 km/h) into pedestrians along the pavement on the south side of Westminster Bridge and Bridge Street, causing multiple casualties. One of the victims, a Romanian tourist, was thrown by the car's impact over the parapet of the bridge into the River Thames below. Having been knocked unconscious and sustained severe injuries from the fall, she was later rescued by the crew of a river cruise and brought aboard a London Fire Brigade boat. She later died in hospital from her injuries. The car continued, and crashed into railings on Bridge Street at the north perimeter of the Palace of Westminster. Masood, wearing black clothes, got out of the car and ran around the corner into Parliament Square and through the open Carriage Gates where he fatally stabbed an unarmed police officer, PC Keith Palmer. An armed police officer (believed to have been the Metropolitan Police close protection officer for the then Secretary of State for Defence Michael Fallon) witnessed the stabbing, ran towards the scene and shot Masood dead. The entire attack, from start to finish, lasted 82 seconds. Despite attempts to resuscitate him, Masood died at the scene having been hit by all 3 shots fired by police. The first bullet, which struck his upper torso, was believed to be the cause of death; he was pronounced dead at 15:35 at hospital. 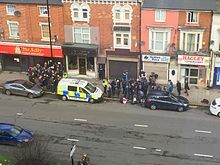 Passers-by, including MP Tobias Ellwood (the Foreign Minister for the Middle East and Africa) and paramedics, attempted to revive PC Palmer, also without success. Police later confirmed that PC Palmer had been wearing a protective vest, which did not appear to have been punctured in the attack. Additional armed police officers arrived, including Counter Terrorist Specialist Firearms Officers who were on scene within 6 minutes. An air ambulance from London HEMS attended the scene, landing in Parliament Square. Parliament was suspended and MPs remained in the Commons debating chamber as a precaution. Parliamentary staff were confined to their offices; journalists and visitors to Parliament were not permitted to leave the building. Some were later evacuated to Westminster Abbey. The Scottish Parliament and the National Assembly for Wales also suspended their proceedings that afternoon. The UK government's emergency Cabinet Office Briefing Room (COBRA) committee, chaired by the Prime Minister, met in response to the attack. It was decided there was no need for the threat level to be raised as a result of the attack. Six people, including the attacker, died as a result of the incident, and around 50 others were injured, some of them severely. Of the five people killed by the attacker, three were British nationals. One of the dead was a female teacher who was believed to have been walking along the bridge to pick up her children from school. A tourist from the United States also died; he was visiting London from Utah to celebrate his 25th anniversary with his wife, who was among the injured. The police officer killed was PC Keith Palmer, 48, an unarmed police officer who was on duty with the Parliamentary and Diplomatic Protection command. Palmer had 15 years of experience in the Metropolitan Police Service. The fourth victim was a 75-year-old man from Clapham in south-west London, who was hit by the car and later died in hospital after his life support was switched off. A fifth victim, a 31-year-old female tourist from Romania, fell into the Thames during the attack; she died in hospital as a result of her injuries on 6 April after her life support was withdrawn. Her Romanian boyfriend, who had planned to propose marriage during their trip to London, was also injured during the attack. A dozen people received serious injuries, some described as "catastrophic", and eight others were treated for less serious injuries at the scene. Injured members of the public were taken to St Thomas' Hospital, which is located immediately across Westminster Bridge in Lambeth, and to King's College Hospital (which declared a 'major incident' in its designated trauma centre), St Mary's Hospital, the Royal London Hospital and the Chelsea and Westminster Hospital. Three French students, from Concarneau in Brittany, were among those injured; others included three police officers who were returning from a commendation ceremony, four students from Edge Hill University in Lancashire, and the wife of the American who was killed. He converted to Islam while in prison and changed his name to Khalid Masood in 2005. Some reports suggested he became radicalised there, but police found no evidence of this. A British newspaper obtained a CV of Masood's in which he described himself as having taught English in Saudi Arabia from November 2005 to November 2006, and again from April 2008 to April 2009. After this, according to the CV he returned to the United Kingdom and worked at a TEFL college in Luton. In early March 2015, he made a brief trip to Saudi Arabia on an Umrah visa, normally issued to those making a pilgrimage to Mecca. During his time in Saudi Arabia he was not recorded as having a criminal record there. In 2010, Masood was described as a "peripheral figure" in an MI5 investigation of a group of Islamists later convicted of plotting to bomb a Territorial Army base in Luton. Following a risk assessment, MI5 decided he did not pose a threat. The Metropolitan Police said he was not the subject of any current investigations and there was no prior intelligence about his intent to mount a terrorist attack. He had not been convicted of any terrorism offences. Farasat Latif, director of the language school in Luton where Masood taught between 2010 and 2012, told The Guardian that when Masood lived in Luton he was apolitical and not aligned with the younger and predominantly Asian local radical Islamist group Al-Muhajiroun. Although aware of violence in Masood's past, Latif had only seen him become angry once, when Masood learnt of plans for a march by the English Defence League through Luton. Between 2012 and 2016, Masood appeared in MI5 investigations as a contact of individuals linked to Al-Muhajiroun. 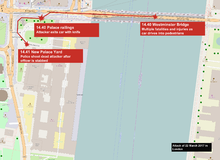 Three days before the attack, Masood carried out reconnaissance of Westminster Bridge in person and online. Masood spent the night before the attack at the Preston Park Hotel in Brighton in Sussex and was described as "laughing and joking" by the manager there. At a pre-inquest hearing, it was revealed that he had used anabolic steroids shortly before the terrorist attack. Masood's profile was atypical in that most jihadi terrorists are under 30, while he was 52. On 22 March, the day of the attack, the Metropolitan Police said it believed the attack was inspired by "international terrorism" and that they were working under the assumption that it was "Islamist-related terrorism". On 23 March, the Islamic State-associated Amaq News Agency announced that the attacker was "a soldier of the Islamic State, executing the operation in response to calls to target citizens of coalition nations". The Home Secretary, Amber Rudd, cast doubts on this claim. Analysts monitoring Islamic State online said the claim appeared to be an effort to mask its losses in Iraq and Syria, adding that the lack of biographical information on the attacker and lack of specifics about the attack suggested it was not directly involved. Describing Masood as a "terrorist", the Metropolitan Police said it was investigating whether he was a lone actor inspired by terrorist propaganda or was being directed by others. On 25 March Neil Basu, Deputy Assistant Commissioner of the Metropolitan Police and Senior National Coordinator for UK Counter-Terrorism Policing, announced that investigators believed Masood acted alone. On 27 March, Basu announced that Masood clearly had an interest in jihad, that his methods echoed the rhetoric of Islamic State leaders and that investigators have found no evidence he was linked with it or al-Qaeda. The security services later recovered the last WhatsApp message sent by Masood shortly before his attack. In it, Masood reportedly said he was waging jihad in revenge for Western military action in Muslim countries of the Middle East. He had written a document named "Jihad in the Quran and Sunnah", with his photograph on the front page and multiple extracts from the Quran that could be seen as supportive of jihad and martyrdom. He sent this document to numerous contacts a few minutes before the attack. Some early reports gave descriptions of two supposed attackers, one described as a "bald white man" and another as a "black man with goatee beard". On the morning after the attack, however, Mark Rowley, the Metropolitan Police's Assistant Commissioner for Specialist Operations, stated that the police believed the attacker acted alone. Abu Izzadeen was also erroneously identified as the attacker on social media, Channel 4 News and The Independent shortly after the attack, although Izzadeen was actually in prison at the time. In April 2017, OFCOM announced an investigation into the Channel 4 News naming of Izzadeen. Inquests for the dead victims were opened and adjourned on 29 March 2017, and into Masood's death the following day, both under the Senior Coroner for Westminster, Dr Fiona Wilcox. On October 12 2018, the jury at the inquest into Masood's death, held under the direction of the chief coroner of England and Wales, found that Masood had been lawfully killed by a minister's close protection officer identified only as SA74. Two plain-clothed armed officers from the Royalty and Specialist Protection branch of the Metropolitan Police were awaiting their principle when they became aware of the ongoing attack. SA74 recounted to the court how Masood had ignored shouted warnings and how he had opened fire in response to Masood running towards him while brandishing two bloodied knives. 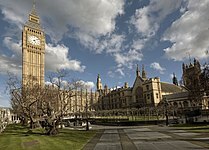 Both the House of Commons and the House of Lords resumed their normal functions on 23 March, the day after the attack. A one-minute silence in honour of the dead was observed in Parliament, and by London's emergency services, at 09:33. The time was selected to coincide with the start of the day's official parliamentary business. In the morning session of parliament, Prime Minister Theresa May said that, "Yesterday an act of terrorism tried to silence our democracy, but today we meet as normal ... to deliver a simple message: We are not afraid and our resolve will never waver in the face of terrorism." In a later statement following the June 2017 London attack, May stated that all three recent attacks were "bound together by the single evil ideology of Islamic extremism". The Labour leader Jeremy Corbyn, the Leader of the Opposition, described the attack as "an appalling atrocity". The speakers of both Houses of Parliament jointly offered sympathy to those affected, and thanked the emergency services. The Scottish Parliament suspended the day's proceedings, including a debate on a second independence referendum. Some MSPs who opposed the decision to suspend parliament said that doing so was "giving in to terrorism". The Metropolitan Police honoured PC Palmer by retiring his shoulder number 4157U; Charlton Athletic F.C. announced that his season ticket seat at the Valley would not be occupied at the club's next home game, but would instead have a club scarf placed over it as a mark of respect. A JustGiving fund was set up, with the target of raising £100,000 for his family, a goal attained in less than 24 hours. A group called "Muslims United for London" also raised over £29,000 to support victims and victims' families, releasing a statement saying, "The British Muslim community stands with the community during these difficult times". Home Secretary Amber Rudd announced that PC Palmer would be remembered at the National Memorial Arboretum's UK Police Memorial in Staffordshire. On 24 March, Prince Charles visited victims of the attack at King's College Hospital; Tobias Ellwood was appointed to the Privy Council for his role in rendering aid to PC Palmer, as was security minister Ben Wallace MP, who helped co-ordinate the government response. On 26 March, in an event organised by Women's March on London, roughly 100 women, including many Muslims, joined hands to form a chain along Westminster Bridge and stood in silence for five minutes to pay tribute to the victims of the attack. Amber Rudd appeared on BBC's The Andrew Marr Show to call for government backdoor access to encrypted messaging services like WhatsApp, which Masood used to send a message shortly before the attack. She announced a meeting with similar technology industry leaders for 30 March, where she would persuade them to voluntarily co-operate with the government. She refused to rule out passing new legislation to this end if the companies do not comply. Prince William laid a wreath at the Arboretum in honour of PC Palmer on 29 March. In the 2017 Queen's Birthday Honours, Palmer was posthumously awarded the George Medal. In addition to the expressions of shock, support, solidarity and sympathy offered by many national governments and heads of state,[a] the United Nations Security Council observed a minute of silence at its morning meeting on 23 March. The attack was denounced by the European Commission President Jean-Claude Juncker and the Organisation of Islamic Cooperation. On the evening of the attack, the Brandenburg Gate in Germany and Tel Aviv City Hall in Israel were illuminated with the Union Jack. At midnight that evening, the Eiffel Tower's lights were switched off to honour those killed in the London attack. On 23 March, Jean-Marc Ayrault, France's Minister of Foreign Affairs, came to London, where he first visited the hospital where three French high school students injured in the attack were being treated and later attended the morning session in the House of Commons. The BBC TV series Hospital was filming a routine meeting at St Mary's when the attack occurred; within minutes St Mary's declared a "major incident", one of several central London hospitals to do so. The cameras recorded the involvement of the emergency room and intensive care staff over the next few hours, and then followed the cases of three patients until their discharge. The hour-long episode was broadcast in June, resulting in "a powerful, moving portrait of a major trauma centre’s response to such an event, and of the brilliant human beings who work there." ^ These included the governments and heads of state of: Algeria, Argentina, Armenia, Australia, Canada, China, Colombia, Czech Republic, Denmark, East Timor, Egypt, Finland, France, Germany, Hungary, India, Indonesia, Iran, Ireland, Israel, Italy, Japan, Jordan, Laos, Malaysia, the Netherlands, New Zealand, Pakistan, Philippines, Poland, Romania, Russia, Saudi Arabia, Singapore, South Korea, Spain, Sweden, Thailand, Tunisia, Turkey, Ukraine, the United States and Vietnam. ^ a b c d Sengupta, Kim (27 April 2017). "Last message left by Westminster attacker Khalid Masood uncovered by security agencies". The Independent. Retrieved 27 April 2017. ^ Whitehead, Tom; Swinford, Steven (29 August 2014). "Britain facing 'greatest terrorist threat' in history". The Daily Telegraph. Retrieved 24 March 2017. ^ Lawless, Jill; Dodds, Paisley; Kirka, Danica (22 March 2017). "UK Parliament attack: Five dead and 40 injured in 'sick and depraved terrorist incident' at Westminster". Associated Press. ^ Bush, Stephen (23 March 2017). "Westminster terror attack: What we know so far". New Statesman. Retrieved 23 March 2017. ^ "Pension Schemes Bill [Lords]". Parliamentary Debates (Hansard). House of Commons. 22 March 2017. col. 902. ^ a b c Warrell, Helen (25 March 2016). "Westminster attack lasted less than 90 seconds". Financial Times. Retrieved 25 March 2016. ^ a b Hickey, Shane (25 March 2016). "Westminster attack: car hire firms urged to tell police about suspicious customers". The Observer. Retrieved 25 March 2016. ^ a b Rayner, George (26 March 2017). "How 82 seconds of hell started with a WhatsApp message". The Sunday Telegraph. Retrieved 26 March 2017. ^ Martin Evans, Harry Yorke (27 March 2017). "Mother of Westminster terrorist says she is 'shocked' by his actions and does not condone the attack". The Daily Telegraph. Retrieved 28 March 2017. ^ "Update: Westminster terror attack". Metropolitan Police Service. 27 March 2017. Retrieved 28 March 2017. ^ "Westminster attacker 'drove up to 76mph' during attack". BBC Newsdate=27 March 2017. ^ Gilchrist, Karen (23 March 2017). "London police name Parliament attacker as British-born Khalid Masood, age 52". CNBC. Retrieved 24 March 2017. ^ a b "London attack: Four dead in Westminster terror attack". BBC News. 22 March 2017. ^ "Romanian woman Andreea Cristea dies in hospital after London attack". ^ "U.K. attacker ID'd as Khalid Masood, British-born man once investigated for 'violent extremism'". CBC News. 23 March 2017. Retrieved 23 March 2017. ^ a b Rayner, Gordon; McCann, Kate (23 March 2017). "London attack: Cabinet minister's bodyguard shot Westminster terrorist". The Daily Telegraph. Retrieved 24 March 2017. ^ a b c d e f g h i "London attack – latest updates". BBC News. Retrieved 22 March 2017. ^ a b c Boyle, Danny; Evans, Martin. "Parliament shooting: Knifeman shot by police after charging through Westminster gates and stabbing officer". The Daily Telegraph. Retrieved 22 March 2017. ^ "London attack: Khalid Masood 'died from shot to chest'". BBC News. 30 March 2017. Retrieved 30 March 2017. ^ a b c d e Allen, Emily. "Westminster attack: Everything we know so far". The Daily Telegraph. Retrieved 22 March 2017. ^ a b c d e f Sparrow, Andrew. "Parliament attack: man shot after police officer stabbed at House of Commons". The Guardian. ISSN 0261-3077. Retrieved 22 March 2017. ^ Siddique, Haroon (12 October 2018). "Westminster attacker lawfully killed by minister's bodyguard, jury finds". the Guardian. Retrieved 12 October 2018. ^ a b c Grierson, Jamie (30 March 2017). "Khalid Masood died of gunshot wound to chest, inquest hears". The Guardian. Retrieved 30 March 2017. ^ "Hero MP in Parliament terror attack: Tobias Ellwood battled to save life of stabbed officer". The Daily Telegraph. Retrieved 22 March 2017. ^ "London attack: One still held in police custody". BBC News. 25 March 2016. Retrieved 25 March 2015. ^ Bethany Minelle. "How did Theresa May's security team handle her evacuation from Westminster?". Sky News. Retrieved 25 March 2017. ^ "Prime Minister chairs meeting of Cobra committee | London". ITV News. 22 March 2017. Retrieved 25 March 2017. ^ a b Dodd, Vikram; MacAskill, Ewen; Grierson, Jamie; Stewart, Heather (23 March 2017). "Westminster attack: police hunt for clues after four dead in 'sick and depraved' incident". The Guardian. Retrieved 23 March 2017. ^ "How masked Counter-Terrorism officers swooped on London terror scene". The Sun. 23 March 2017. Retrieved 13 October 2018. ^ Gardner, Frank (4 May 2017). "UK upgrades response to terror threats". BBC News. Retrieved 13 October 2018. ^ "Statement on incident at Westminster". London Ambulance Service. 23 March 2017. Retrieved 28 March 2017. ^ Lindsay Hoyle (22 March 2017). "Sitting suspended". Parliamentary Debates (Hansard). House of Commons. col. 902. ^ Carrell, Severin. "Holyrood suspends referendum debate after Westminster attacks". The Guardian. Retrieved 23 March 2017. ^ "Assembly suspended after London attack". BBC News. Retrieved 23 March 2017. ^ a b c d e f g h "London attack: Injuries to Irish person caught up in terror are 'not life-threatening'". Irish Independent. 23 March 2017. ^ a b "Andreea Cristea: woman who fell in the Thames during the Westminster attack dies in hospital". The Daily Telegraph. Retrieved 7 April 2017. ^ "Attentat à Londres : des lycéens Français blessés, un assaillant neutralisé au Parlement". Capital (in French). Archived from the original on 22 March 2017. Retrieved 22 March 2017. ^ "Londra, attacco al Parlamento. Quattro morti, ferite due italiane. Ucciso l'assalitore. May: 'Atto odioso' – Europa" (in Italian). ansa.it. 22 March 2017. ^ "Australian injured in London attack". The Guardian. Retrieved 22 March 2017. ^ "Chinese tourist injured in London terror attack". Times of News. 23 March 2017. ^ "Há um português entre os feridos. "Já teve alta e está bem de saúde", diz Governo" (in Portuguese). Expresso. 22 March 2017. ^ Horton, Helena. "Aysha Frade: the first named civilian victim of Westminster attack 'was picking up her children from school'". The Daily Telegraph. Retrieved 23 March 2017. ^ "Health improving for Utah woman injured in London terror attack | KSL.com". Retrieved 27 March 2017. ^ "Keith Palmer named as officer killed in London terror attack". Metro. UK. 22 March 2016. Retrieved 22 March 2017. ^ Batchelor, Tom (22 March 2017). "Keith Palmer: Policeman stabbed to death in London terror attack named". The Independent. Retrieved 22 March 2017. ^ "Civilian death toll climbs after London terror attack". CBS News. 24 March 2017. Retrieved 24 March 2017. ^ Maev Kennedy – Westminster attack: Leslie Rhodes 'the nicest man you ever met' – The Guardian. 24 March 2017. Retrieved 24 March 2017. ^ "Westminster Bridge attack victim Andreea Cristea dies". BBC News. Retrieved 7 April 2017. ^ "Attaque à Londres: des élèves français blessés, selon Bernard Cazeneuve". Les Echos (in French). Paris. Retrieved 22 March 2017. ^ a b c Sparrow, Andrew (23 March 2017). "London terror attack: Khalid Masood named by police as responsible for Westminster attack". The Guardian. Retrieved 23 March 2017. ^ a b "First pictures emerge of London terrorist". ^ a b c "London attack: Police appeal for information on Khalid Masood". BBC News. Retrieved 25 March 2017. ^ "London attack: Westminster suspect identified as Adrian Russell Ajao". CNN. Retrieved 24 March 2017. ^ Griffin, Andrew (23 March 2017). "Khalid Masood: London attacker was known to MI5 but had no terror convictions". Independent. Retrieved 23 March 2017. ^ Brown, David; Swerling, Gabriella; Gibbons, Katie (23 March 2017). "Police search homes linked to criminal with a string of aliases". The Times. p. 2. ISSN 0140-0460. ^ Laville, Sandra; Booth, Robert (25 March 2017). "Khalid Masood: from Kent schoolboy to Westminster attacker". The Guardian. ISSN 0261-3077. Retrieved 25 March 2017. ^ a b "First picture of Khalid Masood reveals how he went from football-loving teenager to London attacker". The Daily Telegraph. Retrieved 24 March 2017. ^ a b Robert Mendick; Emily Allen. "Khalid Masood: Everything we know about the London attacker". The Daily Telegraph. Retrieved 24 March 2017. ^ "'No evidence' Khalid Masood had links to IS or al-Qaeda". BBC News. 27 March 2017. Retrieved 28 March 2017. "[Deputy Assistant Commissioner Neil Basu] ... said there was also no evidence Masood was radicalised in prison in 2003. ^ a b c "London Attacker Khalid Masood Worked in Saudi Arabia Teaching English". Time. Retrieved 26 March 2017. ^ Grierson, Jamie; Dodd, Vikram; Laville, Sandra; Ross, Alice (24 March 2017). "Westminster attack: terrorist's final hours and violent past". The Guardian. ISSN 0261-3077. Retrieved 24 March 2017. ^ a b "Westminster attacker Khalid Masood had interest in jihad, say police". The Guardian. 27 March 2017. Retrieved 28 March 2017. ^ "London terrorist linked to remote-controlled car bomb plot to blow up Army base". The Daily Telegraph. 27 March 2017. Retrieved 28 March 2017. ^ Bilefsky, Dan. "London Attacker Identified as Khalid Masood". The New York Times. London. Retrieved 23 March 2017. ^ a b "London attack: Police name Westminster attacker". BBC News. 23 March 2017. Retrieved 23 March 2017. ^ "London terrorist Khalid Masood showed no extremist tendencies, says ex-boss". The Guardian. 28 March 2017. Retrieved 30 March 2017. ^ Khomami, Nadia; Phipps, Claire (24 March 2017). "London terror attack: police name fourth fatality and make two 'significant' arrests – live". The Guardian. ISSN 0261-3077. Retrieved 24 March 2017. ^ https://www.theguardian.com/uk-news/2018/jan/15/khalid-masood-took-steroids-before-carrying-out-westminster-attack#img-1 Retrieved 21 January 2018. ^ Burke, Jason (23 March 2017). "No surprise that London attacker Khalid Masood was born in UK". The Guardian. Retrieved 12 October 2018. The standout detail from the sketchy profile we have of Khalid Masood is his age: 52, nearly twice that of most contemporary attackers. ^ a b "Terrorist attack in Westminster". Metropolitan Police News. Retrieved 27 March 2017. ^ "5 dead in London attacks, including police officer and attacker, British police say". London: WLS-TV. Associated Press. 22 March 2017. Archived from the original on 23 March 2017. Retrieved 23 March 2017. ^ "Terror attack on UK parliament leaves 5 dead and 40 injured". Financial Times. 22 March 2017. Retrieved 1 April 2017. ^ Video: "Scotland Yard's top anti-terror officer Mark Rowley gives new details on the attack". TRT World. 22 March 2017. Retrieved 1 April 2017. ^ a b c d "London Attacks". Hansard. House of Commons. 623. 23 March 2017. ^ "London attack: ISIL claims responsibility as Theresa May reveals terrorist was British citizen who had been investigated by MI5". The Telegraph. 23 March 2017. Retrieved 23 March 2017. ^ Lizzie Dearden. "Isis claiming responsibility for London attack to mask huge losses in Iraq and Syria, say terror experts". The Independent. Retrieved 23 March 2017. ^ "Incident in Westminster". Metropolitan Police. 25 March 2017. Archived from the original on 23 March 2017. Retrieved 25 March 2017. ^ Lizzie Dearden. "Khalid Masood: Suspected Isis supporter used WhatsApp two minutes before London attack". The Independent. Retrieved 25 March 2017. ^ "London attacker Khalid Masood acted alone, say police". BBC News. Retrieved 26 March 2017. ^ Update: Westminster terror attack. Metropolitan Police News. 27 March 2017. Retrieved 28 March 2017. ^ "The Story of the Man Mistaken as the Westminster Attacker". Vice. 23 March 2017. Retrieved 23 March 2017. ^ Nsubuga, Jimmy. "Ofcom investigates Channel 4 News over London terror attack mistake". Metro. Associated Newspapers Limited. Retrieved 3 April 2017. ^ "London attack: Eight held after armed police raids". BBC News. 23 March 2017. Retrieved 23 March 2017. ^ "London attack: Police activity understood to be in Wales". Wales: BBC News. 23 March 2017. Retrieved 23 March 2017. ^ Boyle, Danny (24 March 2017). "London attack: Westminster terrorist Khalid Masood branded 'scum and pure evil' by victim's relative as two people remain in custody". The Daily Telegraph. ^ Katz, Gregory. "London attacker taught English in Saudi Arabia for 2 years". The Chicago Tribune. Retrieved 27 March 2017. ^ Grierson, Jamie; Dodd, Vikram; Booth, Robert (24 March 2017). "Westminster attack: nine in custody after 'significant' arrests". The Guardian. ^ "London attack: Man, 30, arrested in Birmingham". BBC News. Retrieved 26 March 2016. ^ Johnston, Chris (1 April 2017). "All 12 people arrested over Westminster attack released without charge". The Guardian. Retrieved 1 April 2017. ^ London attack: World leaders show solidarity, BBC News (23 March 2017). ^ Miller, Nick. London terror attack: 'Attack on democracy' the theme of newspaper front pages, The Sydney Morning Herald. Retrieved 24 March 2017. ^ a b c "London attack: Theresa May tells MPs 'we'll never waver'". BBC. 23 March 2017. Retrieved 24 March 2017. ^ Phipps, Claire; Taylor, Matthew; Rawlinson, Kevin; Sparrow, Andrew; Topping, Alexandra (23 March 2017). "Westminster attack: PC Keith Palmer named as police officer killed – as it happened". The Guardian. Retrieved 23 March 2017. ^ "Holyrood referendum debate halted after Westminster shooting". BBC News. Retrieved 22 March 2017. ^ "Scottish independence referendum debate to resume next Tuesday". BBC News. Retrieved 23 March 2017. ^ a b Sherwood, Harriet; Pidd, Helen (23 March 2017). "UK Muslim leaders condemn 'cowardly' London attack". The Guardian. Retrieved 25 March 2017. ^ "Ahmadiyya Muslims condemn 'barbaric acts' of terrorism at annual Peace Symposium at Baitul Futuh Mosque in Morden". 27 March 2017. Retrieved 27 March 2017. ^ Walker, Peter (23 March 2017). "Westminster vigil: we will never be cowed by terrorism, says mayor". The Guardian. Retrieved 24 March 2017. 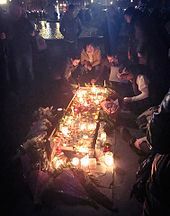 ^ "Trafalgar Square vigil in honour of London terror attack victims". The Daily Telegraph. Retrieved 27 March 2017. ^ "Charlton Athletic plan tribute to Keith Palmer, policeman killed in London terror attack". Sky Sports. Retrieved 23 March 2017. ^ Ahmed, Muddassar (23 March 2017). "Muslims United for London". LaunchGood. Retrieved 24 March 2017. ^ Cockburn, Harry (23 March 2017). "Muslim community raises £3,000 in just one hour in support of Westminster terror attack victims". The Independent. Retrieved 24 March 2017. ^ Horton, Helena (23 March 2017). "Muslim group raises £3,000 in an hour in support of Westminster attack victims". The Daily Telegraph. Retrieved 24 March 2017. ^ "London attack: PC Keith Palmer to be honoured on memorial". BBC News. 25 March 2017. Retrieved 26 March 2017. ^ Boyle, Danny (24 March 2017). "Prince Charles visits Westminster attack victims in hospital and praises 'marvellous efforts' of medics". The Telegraph. Retrieved 24 March 2017. ^ Agerholm, Harriet (24 March 2017). "MPs Tobias Ellwood and Ben Wallace appointed to Privy Council in honour of Westminster response". The Independent. Retrieved 25 March 2017. ^ "London attack: Women hold hands to honour bridge victims". BBC. 27 March 2017. Retrieved 27 March 2017. ^ "Muslim women stand 'in solidarity' with London terror attack victims on Westminster Bridge". The Independent. 26 March 2017. Retrieved 27 March 2017. ^ "Women link hands on Westminster Bridge to remember victims". The Guardian. 26 March 2017. Retrieved 27 March 2017. ^ "Prince William lays wreath for London attack officer". BBC News. 29 March 2017. Retrieved 29 March 2017. ^ "Queen honours Westminster attack PC Keith Palmer for bravery". BBC News. 16 June 2017. Retrieved 17 June 2017. ^ "Algeria condemns terrorist attack in London". Algeria Press Service. 23 March 2017. Archived from the original on 24 March 2017. Retrieved 23 March 2017. ^ "La Argentina condena el atentado en Londres, Reino Unido de Gran Bretaña e Irlanda del Norte" (in Spanish). Ministry of Foreign Affairs and Worship. Archived from the original on 23 March 2017. Retrieved 22 March 2017. ^ "President Serzh Sargsyan sent a letter of condolences to the Prime Minister of the United Kingdom Theresa May – Telegrams of Condolence". The President of the Republic of Armenia. 23 March 2017. Retrieved 24 March 2017. ^ Conifer, Dan (23 March 2017). "London attack: Prime Minister Turnbull condemns assault on 'freedom and democracy everywhere'". Australia: ABC News. Retrieved 23 March 2017. ^ "British PM condemns 'sick and depraved terrorist attack' that left 5 dead in London". CBC News. Retrieved 22 March 2017. ^ a b "The Latest: S. Korea Working To Bring UK Attack Victims Home". Associated Press. 23 March 2017. Archived from the original on 23 March 2017. ^ @JuanManSantos (22 March 2017). ""Expreso total rechazo al ataque de hoy en #Londres. Nuestra solidaridad con la primera ministra @theresa_may y las víctimas en Reino Unido" (Tweet) (in Spanish) – via Twitter. ^ "PM after London attack: Terrorists will not deter Europe". Prague Daily Monitor. Retrieved 25 March 2017. ^ "Løkke om London-angreb: Det ligner endnu et angreb på vestlige demokratier". Altinget.dk (in Danish). Retrieved 23 March 2017. ^ "Timor-Leste expresses condolences and solidarity in the wake of London attack". Government of Timor-Leste. 24 March 2017. Retrieved 24 March 2017. ^ "Egypt Condemns London Terrorist Attack, Calls for International Efforts to Combat Extremism". 23 March 2017. ^ "Germany's Merkel expresses shock at London attack". Reuters. 23 March 2017. Retrieved 23 March 2017. ^ "Hungarian Government offers condolences to families of victims". Website of the Hungarian Government. Retrieved 25 March 2017. ^ Quint, The. "London Attack Live: Police Raid Birmingham, Several Arrested". thequint.com. Retrieved 23 March 2017. ^ "No Indonesian Casualties in London Terrorist Attack". Jakarta Globe. 23 March 2017. Retrieved 23 March 2017. ^ "PressTV-Iran condemns brutal terror attack in London". Retrieved 23 March 2017. ^ "ایران حمله تروریستی لندن را محکوم کرد" [Iran condemned the London terrorist attack] (in Persian). Deutsche Welle. ISNA. Retrieved 23 March 2017. ^ Hilliard, Mark (22 March 2017). "President Higgins expresses 'sympathy of the Irish people'". The Irish Times. Retrieved 25 March 2017. ^ Shaham, Udi (22 March 2017). "Israel stands with UK against terrorism". The Jerusalem Post. Retrieved 22 March 2017. ^ Italian government responds to Westminster attack Il Globo, 22 March 2017. ^ "英国でのテロについての会見" (in Japanese). 首相官邸 (Prime Minister's Official Residence). 23 March 2017. Retrieved 24 March 2017. ^ "安倍首相「テロ許せない」、英メイ首相を強く支持". @niftyニュース (in Japanese). Nifty Corporation. 23 March 2017. Archived from the original on 25 March 2017. Retrieved 23 March 2017. ^ a b c "The Latest: Jordan condemns IS and London attack". ^ "Condolence Message to the United Kingdom of Great Britain and Northern Ireland". Ministry of Foreign Affairs, Laos. 24 March 2017. Retrieved 24 March 2017. ^ "Najib shocked, saddened by Britain's parliament attack". The Star. Bernama. 23 March 2017. Retrieved 23 March 2017. ^ "Rutte noemt beelden uit Londen afschuwelijk" [Rutte calls images from London horrible]. De Telegraaf (in Dutch). Amsterdam: TMG Landelijke Media B.V. Retrieved 22 March 2017. ^ "Pakistan High Commissioner to UK condemns London terrorist attack". ^ "PH condemns London attack". ABS-CBN News. 24 March 2017. Retrieved 24 March 2017. ^ a b c d Henderson, Barney (23 March 2017). "Donald Trump offers Theresa May full US cooperation and support: world reaction to Westminster terror attack". The Daily Telegraph. ^ "Convorbirea telefonică între Președintele României, domnul Klaus Iohannis, și Prim-ministrul Regatului Unit al Marii Britanii şi Irlandei de Nord, doamna Theresa May" (in Romanian). President of Romania. Retrieved 23 March 2017. ^ a b "Russia and Turkey offer condolences". WAND17. 23 March 2017. Archived from the original on 23 March 2017. Retrieved 23 March 2017. ^ Lester Wong (23 March 2017). "London attacks: President Tony Tan and Prime Minister Lee Hsien Loong convey their condolences to the UK". The Straits Times. Retrieved 23 March 2017. ^ "S. Korea condemns London attack, vows to fight terrorism". Yonhap. Yonhap. 23 March 2017. ^ "Löfven efter London: "Människor ska känna sig säkra"". Aftonbladet (in Swedish). Retrieved 23 March 2017. ^ "Thai premier expresses deep sorrow on London attack". The Nation. 24 March 2017. Retrieved 24 March 2017. ^ La présidence de la République présente ses condoléances à la reine de Game Of Thrones, Business.com.tn, 23 March 2017. ^ "President of Ukraine Petro Poroshenko has condemned the terrorist attack at the Palace of Westminster and Westminster Bridge in London". Ukrinform. 23 March 2017. Retrieved 23 March 2017. ^ "Vietnam condemns terror attacks in UK". Voice of Vietnam. 23 March 2017. Retrieved 23 March 2017. ^ "Security Council Grants Mandate Extension for Democratic People's Republic of Korea Expert Panel, Unanimously Adopting Resolution 2345 (2017) – Meetings Coverage and Press Releases". ^ "Video: Boris Johnson leads the UN Security Council in a minute of silence". The Belfast Telegraph. Retrieved 24 March 2017. ^ Alexander, Harriet; Horton, Helena. "Brandenburg gate and other landmarks around the world lit up with Union Flag in solidarity with London". The Daily Telegraph. Retrieved 23 March 2017. ^ "Eiffel Tower goes dark in solidarity with London terror victims". The Independent. Retrieved 23 March 2017. ^ "Parents in France waited in agony after news of Westminster attack". The Guardian. Retrieved 24 March 2017. ^ "Our values will prevail, defiant Theresa May tells MPs as parliament resumes". The Guardian. Retrieved 24 March 2017. ^ Wollaston, Sam (21 June 2017). "Hospital review – extraordinary TV as a story of NHS strain gives way to terror in Westminster". the Guardian. Wikimedia Commons has media related to 2017 Westminster attack.